I’m not a fan of the silly Jason Statham of CRANK or THE TRANSPORTER. I don’t usually mind super-macho silliness, but those films just weren’t for me. On the other hand, I really enjoyed his work in THE BANK JOB, and this seemed to be more of that sort of action movie, one with a more serious slant. Statham playing the pupil of assassin Robert DeNiro and being opposed by ex-SAS agent Clive Owen? That’s a movie I will give a run. I watched KILLER ELITE (2011) on 6.19.12. It was my first viewing of the film. This may sound like a bold statement, but it is not. KILLER ELITE represents one of Robert DeNiro’s best roles of the 21st century. Partly because he does a nice job as the mentor/father figure, and partly because his filmography in the 2000s is sadly lacking. DeNiro does the unexpected here, playing the assassin as a softer aging man, a sort of antithesis of his character in HEAT. Watching KILLER ELITE last night, I kept waiting for a particular betrayal twist which never happened, and I am so glad that it did not. The movie is better for it. The plot involves Statham reluctantly coming out of an early retirement to kill three highly dangerous (and not necessarily evil) targets. Clive Owen is attempting to stop the assassinations. It’s a fairly straight forward plot, though there is a level of newness in the fact that the normal hero/villain lines are blurry, and morality is defined amorphously. The script, despite having an ambitious international story-line, is fairly weak. Points added for the muddy protagonist lines, but more points subtracted for silly exposition which includes having characters tell us exactly who they are and what they do in a clunky way. There is a mysterious group of wealthy men in this which the film could absolutely have done without. I understand that this is based, supposedly, on a true story. However, the inclusion of this ‘secret society’ didn’t help the effectiveness of the movie. The action is very good. The car chases are solid enough, but it is the fight sequences which excel. 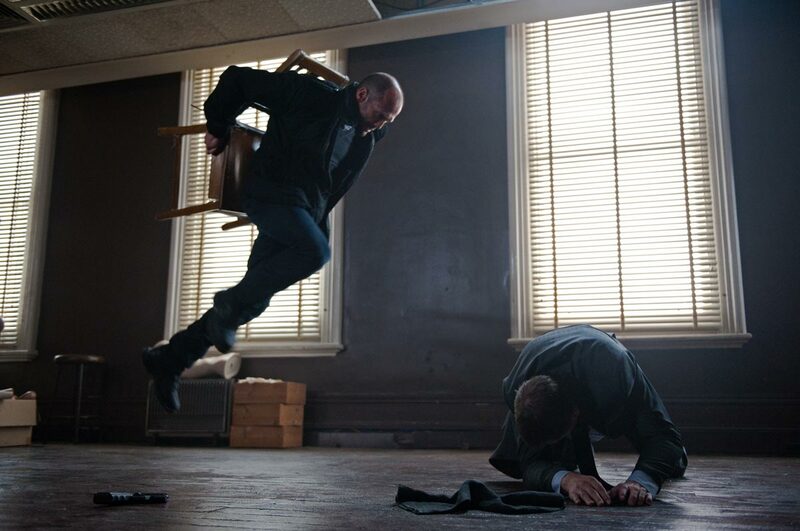 The above-pictured scene which finds Statham tied to a chair is particularly effective, as is the series of events which directly lead to him being put in said chair. The action is a driving force, but it is really the trifecta of Owen/Statham/DeNiro which make this more than just an average flick. Owen is doggedly obsessed as the thorn in Statham’s side. His character gets better as the film progresses. Statham is a solid, if unspectacular, anchor whom we root for. DeNiro is quiet, understated, and effective. He has a scene with Statham’s girlfriend which works very well, and it is the sort of scene which is usually the most forgettable bit of a film of this sort. This film is set in the 1980s. I believe this because they told me. But nothing about the design of this movie says 1980s. It all feels modern and new, and just because they are driving around in older cars doesn’t sell me on the idea that they are back three decades. But this is a point which mostly hurts the film in retrospect, because it doesn’t particularly hinder the enjoyment of the film as it is being viewed. While certainly not excellent, KILLER ELITE is absolutely worth a watch. It may not be quite as intelligent as it believes itself to be, but it is still a step above most of the generic action genre. ~ by johnlink00 on June 20, 2012.